At a first glance, VXV and VIX futures should not be compared at all: VXV is an underlying index, whilst VIX futures are derivatives written on a different underlying index, that is, VIX. As instance, from a fixed income point of view, using VIX futures to seek opportunities on VXV seems like using EURIBOR 3M IRS to seek opportunities on EURIBOR 6M spot price: complete nonsense. However, there's a point I am missing which puzzles me. if I replicate a VXV spot exposure through a carefully strike weighted straddle (see very famous More Than You Ever Wanted To Know About Volatility Swaps by Goldman Sachs' guys), two months later my exposure will converge to a VIX exposure, because my strike weighted options chain is not anymore centered on 3M tenor but on 1M ~ 30D tenor. Therefore I have two positions which deliver the same payoff at some point: no-arbitrage rules would say that they should price the same, which is not true. If VXV is worth 22.5 and VIX 2M futures is slightly above 20.5, could you explain why shorting VXV and long such futures would not return me $2$ points of risk free volatility earnings? 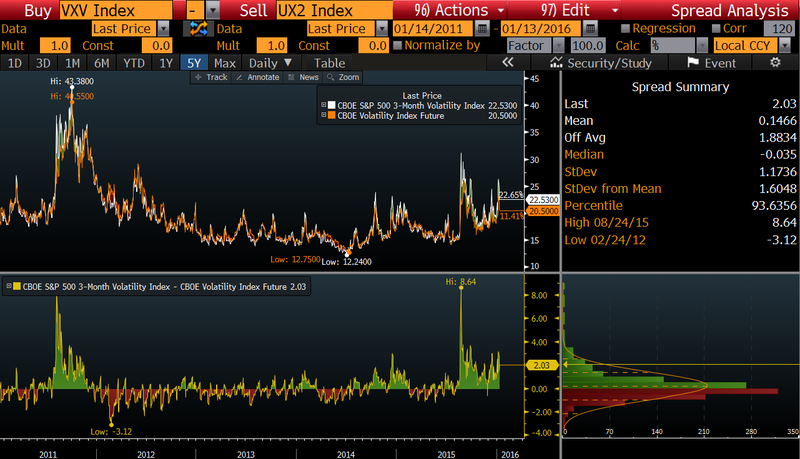 VXV is a 3-month volatility index, and is currently not tradable (there are no futures on it). And since you cannot trade it, you cannot arb it. Not the answer you're looking for? Browse other questions tagged options volatility futures vix term-structure or ask your own question.